Cardinal Joseph W. Tobin and Cardinal Joseph E. Ritter have a lot in common. Obviously, they share a first name. Both served as archbishop of Indianapolis. And they share being close advisors of the pope in the College of Cardinals. Similar to Cardinal Ritter, Cardinal Tobin has also sought to apply his deep faith to pressing social questions of his day, and to lead the faithful under his care to do the same. Cardinal Tobin came to know of Cardinal Ritter when he was a young Redemptorist in formation for the priesthood, spending summers doing ministry in St. Alphonsus Rock Parish in St. Louis, where Cardinal Ritter served as archbishop from 1946 until his death in 1967. The parish was in the middle of a large public housing project, and one of its major buildings was named after Cardinal Ritter. That was because the southern Indiana town was where Cardinal Ritter was born in 1892. He grew up as a member of St. Mary Parish there before becoming a seminarian for the then-Diocese of Indianapolis at Saint Meinrad Seminary and School of Theology in St. Meinrad. The house in which Cardinal Ritter grew up has been restored through the efforts of the Cardinal Ritter Birthplace Foundation, and now serves as the home for non-profit organizations that seek to improve the local community. Displays of photos from his life and other mementoes connected to Cardinal Ritter can also be viewed there. David Hock, a member of St. Mary-of-the-Knobs Parish in Floyd County, is president of the foundation and traces his love of Cardinal Ritter back to when he was a boy in the early 1960s and met him at a reception in New Albany after Cardinal Ritter’s elevation to the College of Cardinals. He appreciates Cardinal Tobin much in the same way as he does Cardinal Ritter. “There’s a similarity between the two of them. I think they’re kindred spirits,” Hock said. “Cardinal Tobin really cares about everybody. He’ll stay around and hear what you say. He’s as down-to-earth as Cardinal Ritter was. Cardinal Ritter was ordained a priest for the Diocese of Indianapolis in 1917, and was a close collaborator with then-Bishop Joseph Chartrand. Cardinal Ritter was appointed auxiliary bishop of the diocese in 1933. Less than a year after his episcopal ordination, however, Bishop Chartrand died. Bishop Ritter was selected to succeed him in 1934. He became archbishop of Indianapolis when the diocese was raised to an archdiocese in 1944. In the early years of Cardinal Ritter’s priestly life and ministry, the Ku Klux Klan rose to prominence and influence in Indiana politics and society, putting pressure on Catholics in the state as well as people in minority communities, especially blacks. This may have been one factor that led to Cardinal Ritter becoming an advocate for the black community after he became bishop of Indianapolis. In 1937, he began an effort to end racial segregation in Catholic schools in the Church in central and southern Indiana—17 years before the U.S. Supreme Court made it the law of the land in Brown v. Board of Education of Topeka. Cardinal Ritter later established the same school desegregation policy in St. Louis. His legacy in desegregating schools in the archdiocese continues today in schools in various parts of central and southern Indiana, which boast students from many cultural and ethnic backgrounds. One of them— Cardinal Ritter Jr./Sr. High School in Indianapolis—is named after the man who paved the way for these historic changes. Although perhaps not on the same scale as Cardinal Ritter’s groundbreaking work in desegregation in two archdioceses, Cardinal Tobin has taken action in his time leading the Church in central and southern Indiana to show care for people at the margins of society. Despite the action of Gov. Mike Pence to block the resettling of Syrian refugees in the state, Cardinal Tobin ordered the archdiocese’s Refugee Resettlement Services to welcome a Syrian family in Indianapolis in December 2015. Cardinal Ritter and Cardinal Tobin also sought to be good stewards of the material resources of the archdiocese. Cardinal Ritter led the Church in central and southern Indiana during the economically tumultuous Great Depression. When he was appointed bishop of Indianapolis in 1934, it was heavily in debt. By careful financial management, however, he reduced that debt and put the archdiocese in a position to expand greatly at the start of the Baby Boom era following the end of World War II. Cardinal Ritter didn’t get to lead the expansion of the Church in central and southern Indiana after the war. 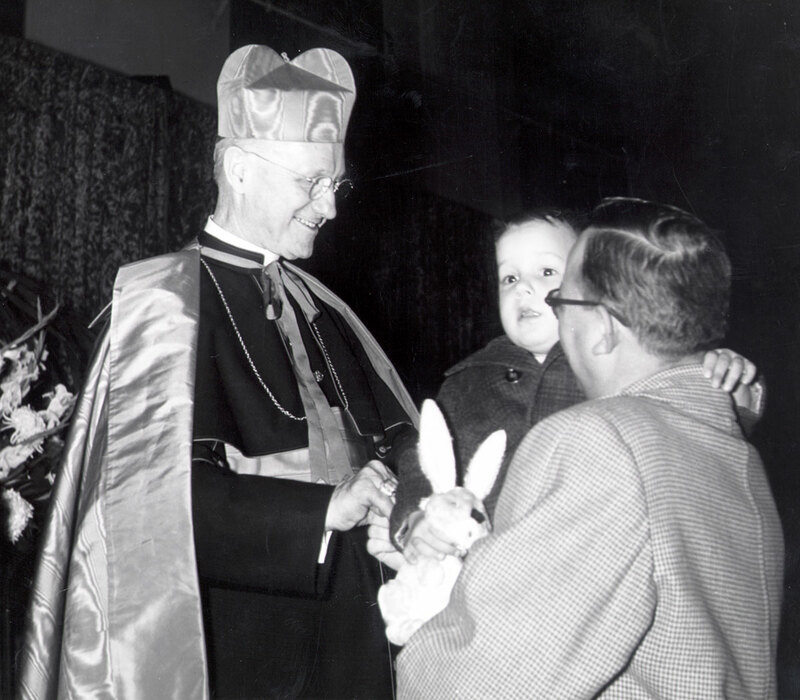 In 1946, he was appointed to lead the Archdiocese of St. Louis. The movement of many people from cities and rural areas to suburbs led to the founding of many new parishes in the archdiocese from the late 1940s through the late 1960s. Demographic changes of a different kind were factors that led Cardinal Tobin, after consulting with many clergy, religious and lay faithful across the archdiocese, to merge some parishes in various parts of central and southern Indiana through the “Connected in the Spirit” planning process. Although he knew the hardship such decisions would cause the faithful in affected parishes, Cardinal Tobin made them nonetheless in order to help the Church in central and southern Indiana be in the best position to achieve its ongoing mission. In 1961, 15 years after leaving the Archdiocese of Indianapolis for St. Louis, Cardinal Ritter became a member of the College of Cardinals. He participated in all four sessions of the Second Vatican Council, and in the 1963 conclave that elected Blessed Paul VI as pope. At the council, Cardinal Ritter was a vocal advocate of its “Declaration on Religious Freedom,” and of the council’s effort to promote good ecumenical and interfaith relations between the Church and other Christian communities and world religions. Cardinal Tobin has similarly been a leader in ecumenical relations, serving as the co-chair of the North American Catholic-Orthodox Consultation and establishing many close relationships at the local level with religious leaders from a host of faith communities. As he prepares to leave the Church in central and southern Indiana to lead the Archdiocese of Newark, Cardinal Tobin looks back at the life and ministry of Cardinal Ritter with admiration. “He believed that being disciples of Jesus obliges us to act with justice in civic life,” Cardinal Tobin said. “His courageous stance against racial segregation and his determination to translate faith into action are examples of his understanding of what it means to be a disciple today.